So my WordPress app tells me it’s 192 days since my last post – I think that counts as “infrequent”… Must be about that long since I’ve had a properly big night out too, but that’s going to get sorted this weekend – believe me, that’s going to get sorted! I’ve mentioned before about how mad it is that the little town we live in – Hebden Bridge, population 4500ish – has played host to many of the best gigs, club nights and assorted events I’ve been to. Most cities would be proud of the lineups we’ve seen in the decade we’ve lived here. 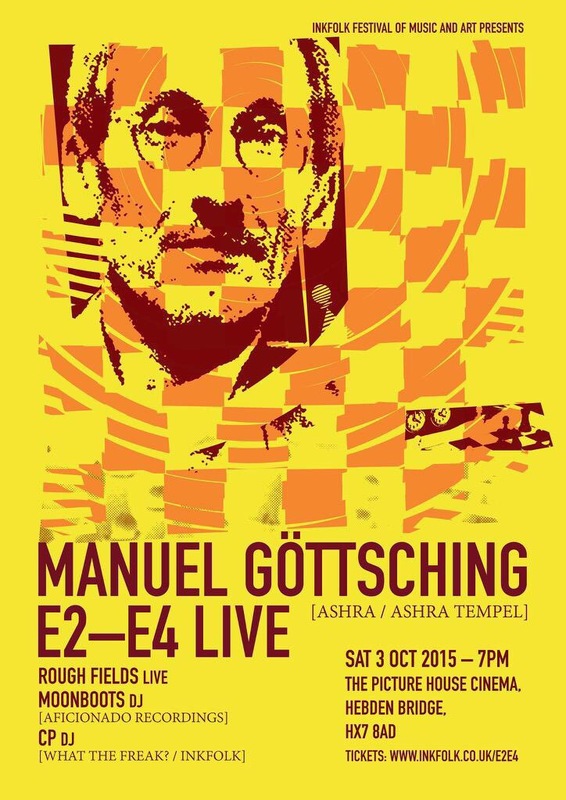 And this Saturday, down at the cinema on New Road, the maddest, most mind blowing event we’ve seen yet is coming to town – Manuel Göttsching will be here to play his masterpiece E2E4 live for the first ever time in the UK as part of the always excellent Inkfolk arts/music weekend. Bonkers. 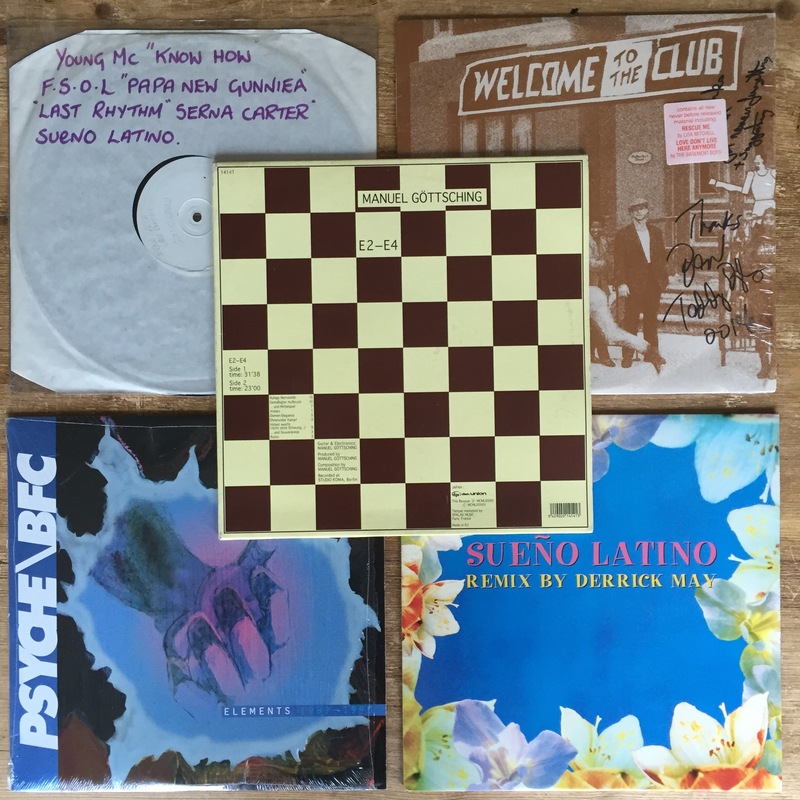 The story of E2E4 doesn’t need to be written again by me, but aside from being one of Larry Levan’s most celebrated discoveries, it runs through my own record collecting history like no other record I know. Once I moved to Liverpool after Uni I got to know more and more people that shared my love of house and techno, particularly the lads that had already started putting on T-Funkshun. It was probably the night at Nation with Derrick May that made me decide to get involved myself – an expensive decision, but definitely worth it! Next came the start of my New York House obsession, culminating in the revelation from Cynthia Cherry that Jonathan Mann had written B Cause specifically as a replacement for E2E4 on the Welcome To The Club compilation. One of my treasured discoveries that. Then there’s E2E4 itself – I’ve never owned a copy myself, but as I wrote in this House Hunting piece recently, I’ve been looking after a dear friend’s collection and this is one of his. I only found it in there a few weeks after Chris from Inkfolk had told me about the gig, so the hour spent sat listening was all the more poignant. So if it’s not clear from that lot, on top of everything you already know about Manuel Göttsching and the fact that after 26 years he’s finally giving his debut UK performance here in little old Hebden Bridge, I’m pretty excited about Saturday night. If anyone nearby ever reads this and still wants a ticket, I think there’s a handful left – see you there! Gutted! Only just foud your blog and read this. I would have come too, i only live in Littleborough!! Ah – I’m sorry to hear that mate, don’t suppose it’ll help much if I say it was amazing..? The sound and atmosphere in there was huge, within about 10mins people were up out of their seats dancing and by the end half the cinema was down the front. Special stuff.